Call The Aerial Guys today on 01254 492032 for a no obligation estimate and to arrange an appointment. 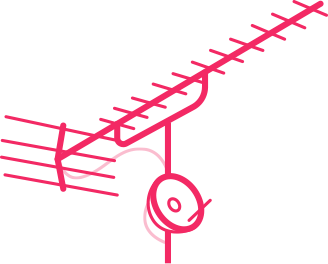 Are you looking for TV Aerial Installation Accrington or local TV aerial or satellite dish installation and repair experts, then call The Aerial Guys. We are passionate about providing you with the best possible service. Contact us today on 01254 492032 to book an appointment. Working right across Hyndburn, our network of The Aerial Guys engineers means we can nearly always ensure an expert engineer visits your Accrington home the very same day. If you are looking for a TV aerial installation Accrington call us, as we have carried out many quality installations over the years, so we really do know our job. And, unlike the larger, more impersonal companies, The Aerial Guys really do provide a reliable local service that you can depend on. So, why not book your appontment with The Aerial Guys today on 01254 492032. Our friendly and professional engineers will assess your TV aerial requirements and give you a fixed price quote, before they start any work. Whether you need TV aerial repairs in Accrington, TV Aerial Installation Accrington or are installing a new TV setup, The Aerial Guys are ready and waiting to make sure you get the clearest picture. Speak to one of our technical advisers today on01254 492032 to find out how to arrange a visit from your local Accrington engineer. The Aerial Guys are also experts in satellite installation and repairs. If you need a comprehensive satellite installation in Accrington, then our engineers can set-up the whole kit – from fitting your satellite dish, to configuring your set-top box and cabling. Here at The Aerial Guys, we are specialists in all the main satellite services, including Sky, Freesat and European satellite installations. Is your satellite signal frustratingly scrambled or pixelated? The Aerial Guys can carry out full satellite repairs in Accrington and the surrounding area. Our professional engineers always carry a wide range of equipment suitable for all main satellite types, which means that we can often fix the problem there and then. So, if you live in the Accrington area, and need a local satellite repair service, speak to The Aerial Guys today on 01254 492032. When Dave’s brother announced he was coming to visit him in Accrington, Dave really wanted to make a great impression and gather a welcome party for his rugby loving brother. But the satellite equipment he was using was pretty outdated and wasn’t compatible with some of the newer sports satellite systems. “I was so excited when I heard Michael was coming to visit. We’d not seen each other for about 10 years so it was quite a big deal really. I know how much he loves his rugby and I really wanted him to feel at home,” Dave says. Dave contacted The Aerial Guys to see if they could help. “I had all the equipment but no idea how to put it all together. The Aerial Guys came round the same day – I couldn’t believe they were so fast! It only took a couple of hours to get the system up and running. Plus, the cost wasn’t nearly as much as I expected. If you need TV aerial repairs in Accrington then there’s no other choice really. I’ll be recommending The Aerial Guys to all my mates from now on!” he says.